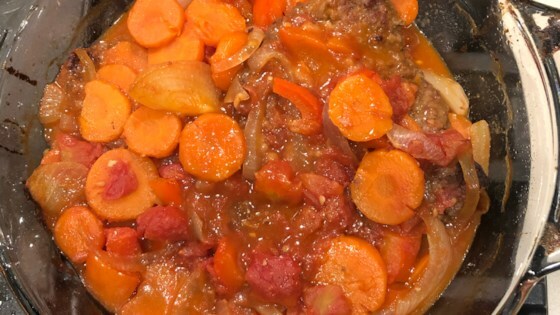 "This is a variation on another recipe, which is great as is, but I couldn't make Swiss steak without green peppers or garlic. I also season the meat instead of the flour; it gets a more intense taste that way." Cut steak into four portions and pound to 1/4-inch thickness; season with salt, pepper, and seasoned salt. Coat meat evenly with about 1 tablespoon flour. Heat oil in a skillet over medium heat. Cook beef in hot oil until browned completely, 3 to 5 minutes per side; transfer to prepared baking dish reserving drippings in the skillet. To the drippings, add tomatoes, onion, green bell pepper, beef broth, carrots, celery, garlic, 1 tablespoon flour, and Worcestershire sauce. Bring the tomato mixture to a boil; cook and stir for 2 minutes. Pour the mixture over the meat in the baking dish. Cover dish with aluminum foil. Bake until beef is completely tender, about 90 minutes. Sprinkle cheese over beef and return to oven uncovered until cheese is melted, 3 to 5 minutes. Easy to put together and good tasting. Wonderful. The sauce was so good. And not too hard to make.